Much has been learned about the effects of the Indo-Pacific warm pool on winter climate. These occur primarily in association with the interannual expansion (contraction) and eastward (westward) migrations of the Indo-Pacific warm pool that accompany El Niño (La Niña) events. The winter effects mainly involve several tropospheric processes: (1) alteration of the subtropical jet streams and associated storm tracks; (2) changes in the intensity and/or location of the nodes of the Walker and Hadley circulations; and (3) excitations of stationary Rossby wave trains such as the Pacific-North American pattern. ENSO’s Pacific teleconnections to global climate and weather are limited mainly to the winter season; hence, these have been the overriding basis and emphasis for winter climate outlooks. Attempts to link ENSO directly to summer climate impacts have been much less successful and a palpable need exists to find other sources of summer climate predictability. Recently, the variability and effects of the tropical Western Hemisphere Warm Pool (WHWP) have been emphasized for Western Hemisphere climate. At various stages of development, the WHWP is comprised of the eastern North Pacific west of Central America, the Intra-Americas Sea (IAS) (i.e., the Gulf of Mexico and the Caribbean) and the western tropical North Atlantic (Fig. 1). Unlike the Indo-Pacific warm pool, which straddles the equator, the WHWP is entirely north of the equator. Sandwiched between North and South Americas and between the tropical North Pacific and Atlantic Oceans, the WHWP is the second largest body of very warm water on Earth and hosts the second largest diabatic heating center of the tropics during the boreal summer. The Central America landmass divides the WHWP into two ocean regions: (1) the eastern North Pacific warm pool and (2) the Atlantic Warm Pool (AWP). Anomalies of the eastern North Pacific warm pool are more likely to mimic those of ENSO events since it is close to the ENSO region of maximum variance and is directly related to ENSO variability through ocean dynamics. Given our interest in non-ENSO factors that influences summer climate, our research mainly focuses on variability of the AWP. Our NOAA-funded research used numerical models and observations to investigate the influence of the AWP on summer climate and hurricanes. Research topics include (1) variability of the AWP; (2) variability of the North Atlantic subtropical high; (3) variability of the easterly Caribbean low-level jet and its moisture transport; (4) variability of the southerly Great Plains low-level jet and its moisture transport; (5) the relationships of U.S. rainfall with the AWP, low-level jets and the North Atlantic subtropical high; (6) the effects of external influences versus local ocean-atmosphere processes on AWP variability; (7) the relationships among environmental factors contributing to Atlantic hurricanes; and (8) extreme events such as tornados and Midwest floods and their relationships with moisture transport from the AWP region. One of the highlight in our findings is that the AWP's multidecadal variability coincides with the signal of the Atlantic Multidecadal Oscillation (AMO); that is, the warm (cool) phases of the AMO are characterized by repeated large (small) AWPs. Since the climate response to the North Atlantic SST anomalies is primarily forced at the low latitudes and the AWP is in the path of or a birthplace for Atlantic tropical cyclones, the influence of the AMO on Atlantic tropical cyclone activity may operate through the mechanism of the AWP-induced atmospheric changes (Figure 1). Figure 1. SST composites of (a) large Atlantic warm pools and (c) small Atlantic warm pools during June to November. Atlantic major hurricane tracks for (c) 14 years of large Atlantic warm pools and (d) 15 years of small Atlantic warm pools. Lee, S.-K., D. B. Enfield and C. Wang, 2011. Future Impact of Differential Inter-Basin Ocean Warming on Atlantic Hurricanes. Journal of Climate, In-press. Enfield, D.B., and L. Cid-Serran, 2010. Secular and multidecadal warmings in the North Atlantic and their relationships with major hurricane activity. International Journal of Climatologe, 30, 174-184 2010. Munoz, E., and D. Enfield, 2010. Springtime variability of the Intra-Americas low-level jet and its relation with precipitation and tornadoes in the eastern United States. Climate Dynamics, 33, doi:10.1007/s00382-009-0688-3. Munoz, E., C. Wang, and D. Enfield, 2010. The Intra-Americas Sea springtime surface temperature anomaly dipole as fingerprint of remote influences. Journal of Climate, 23, 43-56. Wang, C., S.-K. Lee and C. R. Mechoso, 2010. Inter-Hemispheric Influence of the Atlantic Warm Pool on the Southeastern Pacific. Journal of Climate, 23, 404-418. Lee, S.-K., C. Wang and B. E. Mapes, 2009. A Simple Atmospheric Model of the Local and Teleconnection Responses to Tropical Heating Anomalies. Journal of Climate, 22, 272-284. Lee, S.-K., D. B. Enfield and C. Wang, 2008. Why Do Some El Ninos Have No Impact on Tropical North Atlantic SST? Geophysical Research Letters, 35, L16705, doi:10.1029/2008GL034734. Wang, C., S.-K. Lee and D. B. Enfield, 2008. Climate Response to Anomalously Large and Small Atlantic Warm Pools During the Summer. Journal of Climate, 21, 2437-2450. Lee, S.-K., D. B. Enfield and C. Wang, 2007. What Drives Seasonal Onset and Decay of the Western Hemisphere Warm Pool?. Journal of Climate, Vol. 20, No. 10, 2133-2146. Wang, C. and S.-K. Lee, 2007. Atlantic Warm Pool, Caribbean Low-Level Jet, and Their Potential Impact on Atlantic Hurricanes. Geophysical Research Letter, Vol. 34, No. L02703, doi:10.1029/2006GL028579. Wang, C., S.-K. Lee and D. B. Enfield, 2007. Impact of the Atlantic Warm Pool on the Summer Climate of the Western Hemisphere . Journal of Climate, Vol. 20, No. 20, 5021-5040. Enfield, D. B., S.-K. Lee, C. Wang, 2006. How Are Large Western Hemisphere Warm Pools Formed?. Progress in Oceanography, Vol. 70, No. 2-4, 346-365. Wang, C., D. B. Enfield, S.-K. Lee, C. W. Landsea, 2006. 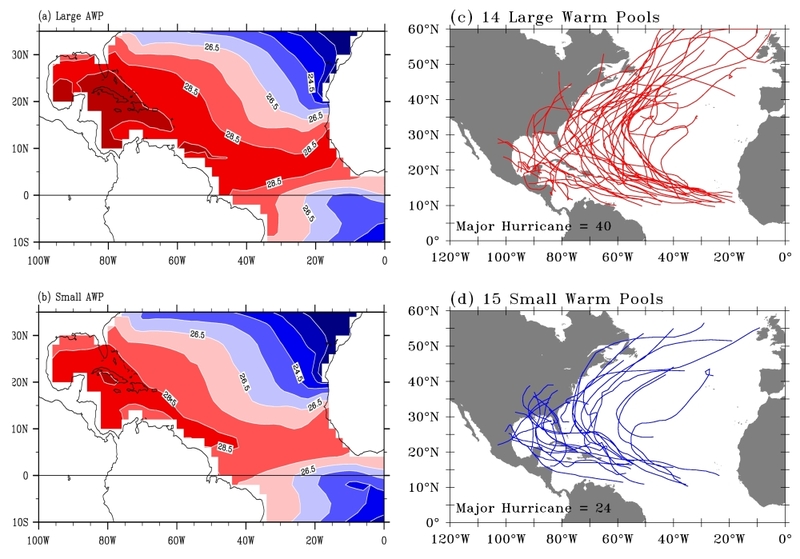 Influences of Atlantic Warm Pool on Western Hemisphere Summer Rainfall and Atlantic Hurricanes. Journal of Climate, Vol. 19, No. 12, 3011-3028. Enfield, D. B., S.-K. Lee, 2005. The Heat Balance of the Western Hemisphere Warm Pool. Journal of Climate, Vol 18, No. 14, 2662-2681. Lee, S.-K., D. B. Enfield, C. Wang, 2005. Ocean General Circulation Model Sensitivity Experiments on the Annual Cycle of Western Hemisphere Warm Pool. Journal of Geophysical Research, Vol. 110, No. C09004, doi:10.1029/2004JC002640. Wang, C., and D.B. Enfield, 2003. A further study of the tropical Western Hemisphere warm pool. Journal of Climate, 16, 1476-1493. Wang, C., and D.B. Enfield, 2001 The tropical Western Hemisphere warm pool. Geophysical Research Letters, 28, 1635-1638.